I am a Bangladeshi photographer, writer and activist with a special interest in education, new media and ICT. I was a research tutor at London University where I obtained a PhD in organic chemistry before taking up photography as a profession. 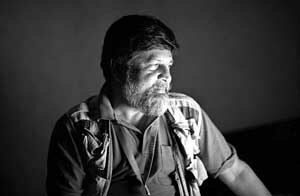 I am a former president of the Bangladesh Photographic Society and set up the award winning Drik Picture Library. I also set up the Bangladesh Photographic Institute and Pathshala, the South Asian Institute of Photography and the DrikNews photo agency. I am the director of Chobi Mela the festival of photography in Asia. My work has been shown in the Museum of Modern Art in New York, the Tehran Museum of Contemporary Arts, the Royal Albert Hall in London, Le centre Georges Pompidou in Paris and the National Art Gallery in Kuala Lumpur. I have chaired the World Press Photo international jury. I am an honorary fellow of the Royal Photographic Society, a board member of the National Geographic Society and the Eugene Smith Foundation. I am currently visiting professor of photography at the University of Sunderland. In 2007 I lectured at Harvard, UCLA and Stanford universities in the USA, Ateneo de Manila University in the Philippines and Universidade Eduaro Monldane in Mozambique and was one of the Masters in the Joop Swart Masterclass organised by World Press Photo. That year I also had two books published, “Nature’s Fury” on the earthquake in Kashmir and “Portraits of Commitment” a book of portraits of leaders in the fight against HIV/AIDS in South Asia. Being a resident of a small town in the UK, it was refreshing to see your face in the introductory page of NI. It’s an informative journal, and I try to buy it whenever I get the chance. I bought it today, so I look forward to reading it. Hello. We were looking for a way to contact you to see if you could tell us about what s happening in the country. We are a french international tv. I just discovered your blog via Nancy White and your photos are amazing! I am really impressed with your Photograph amazing photos. Please if you could send me an e-mail so we both can share some news with each other. Keep up the good work. I really enjoyed reading your web site great posting looking forward to see you one day soon in Dhaka. I am proud to be your student. My name is Amit currently working for a magazine in Mumbai. I want seek guidance in respect to some photo projects I have undertaken and want to send you some pictures that I have taken for your valuable comments. It will be nice of you if you can send me your contacts so that I can send my pictures across to you for your views. I heard about you and your brave team who worked for so many dared area like Afganistan, Pakistan and so many places in the world. Am one of fan of your Drik organisation and also your working process. I would be happy if i could join your team and could wotk with you. i was going through your photography and had ammaised by the view you have in your mind and your lance have, wonderful, briliant, such a talent to put things up. Your pictures are compelling and beautiful. I’m a videojournalist for Current TV in the U.S. and the UK, and we’re desperately trying to find videographers in the area who can shoot some video and interviews in the devastated areas. Do you know anyone who can help us with this? We do offer compensation for the product. Thanks for your significant contribution to the coverage of such a tragedy. I heard about you from my friend Pierre Claquin. I read you blog often and it is interesting with various topics. I will appriciate your comments. I am really happy to see ur website. Congratulation. More over ,different information in the site has made it more reach. It might be a resource for the journalist like me. I will recommend my all friend to use this portal. I recalled the days in Lahore. The last time I saw you, was in Rangamati, Hotel George. Is that right ? You were in a hurry :- ) ? amazing blog. its very happy to see arthur c clark and some rare pictures. We spoke at the Dutch Embassy in Dakar earlier this week, I finally took the time to go through your blog. For me, it was an interesting discussion. This being a small world, I’m pretty sure we’ll meet again. Hello, I have been trying to contact you about my exhibitions here in New York. Please contact me. Thank you. Please write directly to shahidul@drik.net. Your tiger photo is all over Zia International Airport. This is Todd Lester of freeDimensional.org, I would like to encourage you to start a profile on our new community portal and then to cross post your newsletters there in a forum. Our community would like to know about your work AND there is a special group for photographers as well as a unique photography function by which you can show us some of the work of the agency and let our community learn about Drik. Thanks from A.K.M Ali hossain. BLRI, SAVAR . Dhak-1341. Bangladesh. +88 01714328267 .